When I first heard the word michirones, Manolo and I were strolling through Murcia’s historic center trying to decide where to stop for tapas. He casually suggested we try michirones at El Pepico del Tío Gínes, and I, having been in Murcia for less than one month, literally had no idea what he was talking about. Nothing sounded familiar, which is not surprising in retrospect, for you can’t get much more local than this. 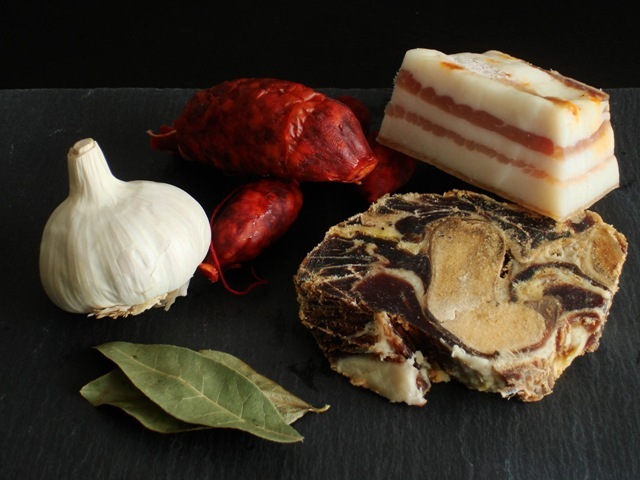 Michirones, I would find out, are fava beans stewed with cured ham, bacon, chorizo, garlic, a good dose of sweet pimentón and bay leaves. This classic Murcian tapa is rustic and hearty, packed with sustenance and a deep cured ham flavor. The pimentón and chorizo turn the broth a vibrant red color that is both warming to look at and to eat. This is not to say that the delicious broth goes unconsumed. For soaking up the pimentón spiked liquid, fresh bread is the favored tool, dipped with gusto directly into the common dish. The bar where I had my first michirones, El Pepico del Tío Gines, was founded in 1935 and is a tradition in itself, with an ambiance you’d expect in an old Spanish bodega –chrome bar, hams hanging from the ceiling, the requisite wooden barrel. I loved my first taste of michirones, unlike anything I had ever eaten, although I struggled to remember how to say what I had eaten. The word just wouldn’t stick. I can’t remember exactly when the word michirones began flowing off my tongue naturally. I think it was a gradual process, aided by weekly dinners with friends at the cantina of a neighborhood association dedicated to preserving local traditions. We’d invariably order the flavorful michirones, some of the best I’ve had (the restaurant has since closed, sniff, sniff). After watching Valentina, Manolo’s mom, prepare a batch, I decided it was time to try for myself. So how about some michirones for dinner? This recipe is based on Valentina’s version in addition to recipes I consulted in the following books on local cuisine: Las 50 Mejores Recetas de la Cocina Muricana and Memorias de la Cocina Murciana. The dish is traditionally prepared with unshelled dried fava beans. Peeled and split beans fall apart more easily in the cooking process, which isn’t appropriate for this dish. Keep in mind that the cooking time can vary depending on the size and age of the beans. 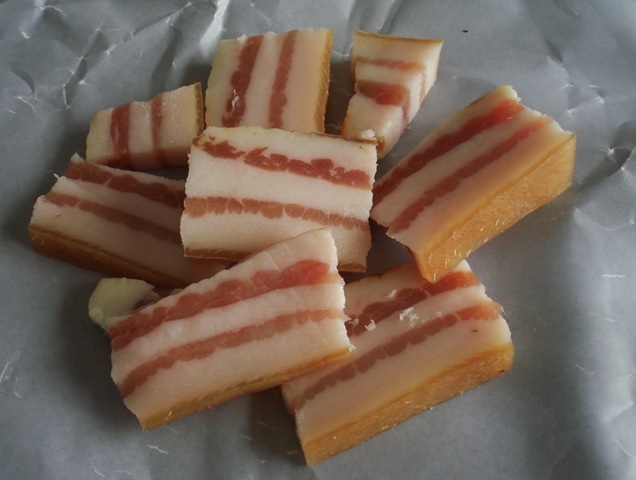 If the skins are too tough for your liking, simply remove them as you are eating by squeezing on the shell with your fingers to release the soft interior into your mouth. 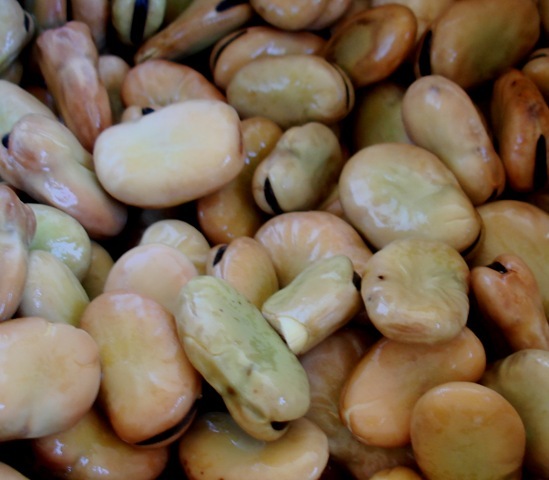 In fact, you often see heaps of fava bean skins on plates when michirones have been served. I suggest not adding any extra salt until the end, if it is needed. I have found that the cured meats provide enough. A strong red wine from Jumilla, a wine-producing zone in Murcia, pairs well with the dish. Put all ingredients (except salt and pepper) together in a 5-quart soup pot. Bring to a boil over high heat. Boil, uncovered, for 10 minutes and skim off any foam. Lower heat and simmer, partially covered, stirring occasionally, until the beans are tender but not falling apart, about 2-2 ½ hours. Add more water if necessary. (The cooking time can vary depending on the size and age of the beans.) 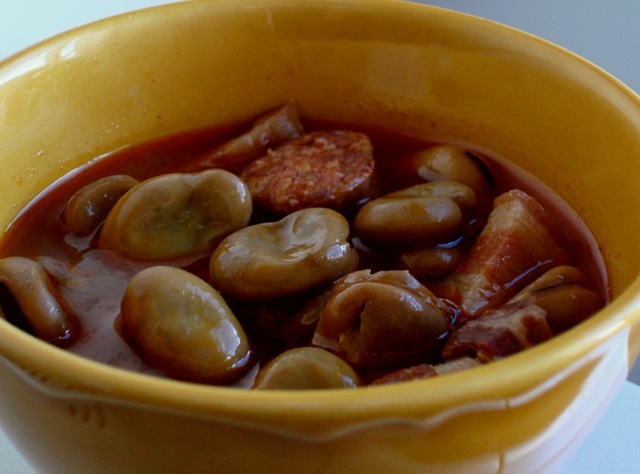 The broth should be intensely red from the pimentón and chorizo, but relatively thin and clear in consistency. Once the beans are cooked, season with salt and pepper to taste. *NOTE: Some recipes say to soak the beans for 48 hours, changing the water once or twice. I haven’t tried this yet, but am curious to see how much the longer soak decreases the cooking time. Next time I’m home we’ll have to do another tapas night! Hi Tony, Thanks so much for stopping by. Let me know how your michirones turn out!